I watched The Hobbit: The Battle of the Five Armies on Friday night and it was epic. Quite a few differences from the book, but a grand movie nonetheless. The entire cinema teared up over the two deaths (I bawled through two tissues despite expecting it from the book) and applauded Legolas's agility. I have been spending the better part of the weekend refreshing my memory by returning to Tolkien's books and I haven't managed to do a quarter of the errands I intended to complete, though I have ROTK left to re-read now. All I can talk about are Thorin, Kili, Bard and others from Middle-Earth. But I can talk about wine anytime. White is my favourite version, though I will go for red when white is not to be had. Anytime, all the time, be it sauvignon blanc, pinot gris or chardonnay. I also have a love for country wines. I went on a trekking holiday in October and returned with 14 bottles - fig, gooseberry, passion fruit, grape, pomegranate, pineapple and so on - and have got through only three bottles so far. Fig wine was particularly nice. When Memebox released a Wine and Cheese skincare box, I did not wait to look at the price, description, shipping date or even my credit card balance before placing my order. 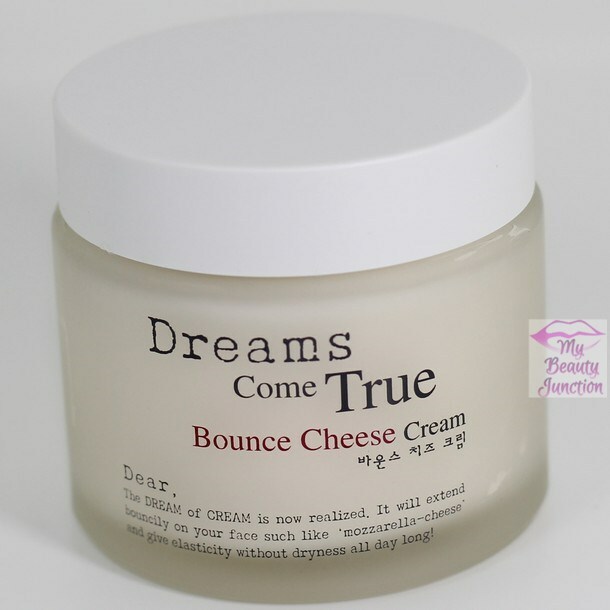 We all know the benefits of wine-based skincare, and I already love the Dear by Enprani Bounce Cheese Cream. 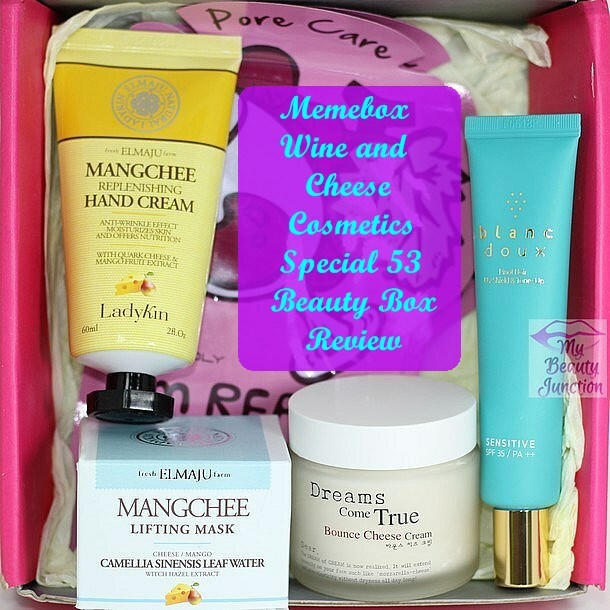 Check out my review and unboxing of the Memebox Special 53 beauty box, Wine and Cheese Cosmetics. There was also supposed to be an Innisfree Wine Peeling Jelly Softener, but the brand did not deliver, so Memebox included a new Meme Mask from their own range instead and reimbursed $12 Memepoints to everyone who had ordered this box. I'm not upset; I don't use softeners anyway, although the packaging of the Innisfree thing was like a wine bottle and I would have loved to place it in my cabinet. I will talk about the Meme Mask on another occasion, since there are already two sheet masks in this box. Here are my first impressions of the five full-sized products in here. Everything smells so, so good. This mask smells more of mango and less of cheese. It is a sleeping mask you leave in overnight. 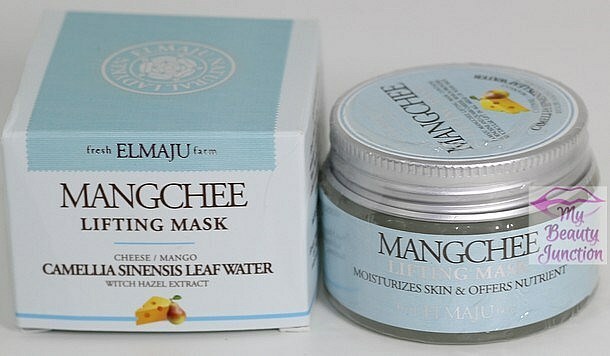 It contains mango, cheese and shea butter and is meant to hydrate and lock in moisture. This is perfect for the drier months. One use later, I know I will be reaching for this jar frequently over the next couple of months. I am in LOVE! 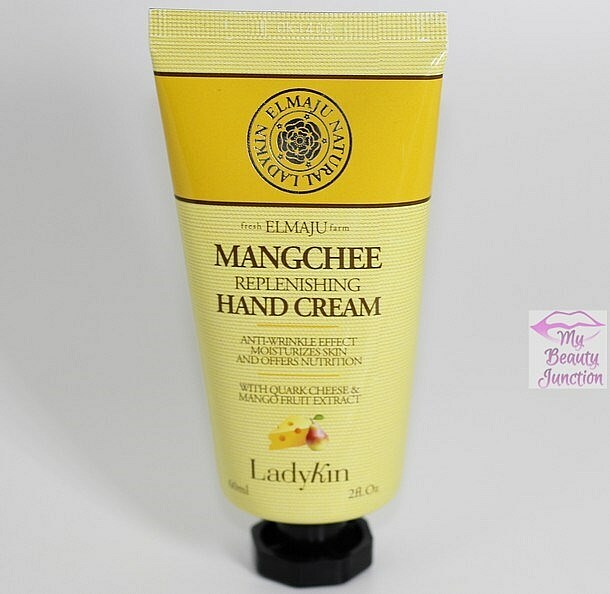 This hand cream smells of mangoes and cheese. The combination does not sound great, but it smells sweet and pleasant. The cream is lightweight and silky and great for overnight use, because the smell is more soothing than irritating. I do wish the packaging did not imitate L'Occitane. This cream contains quark cheese and mango extracts, bacillus/corchorus olitorius leaf ferment filtrate, which Cleopatra supposedly used for skincare, according to the product card (mallow leaves, nothing else), adenosine, camellia leaf and polyphenol. It is an anti-wrinkle hand cream and moisturises very well. A red wine-based sunscreen? Yes, please! This is a milk, non-oily sunblock. It provides only moderate protection - SPF15 - which is insufficient in the tropics, but it also contains resveratrol, the antioxidant in red wine, and great for skincare. I will probably use this during the rains, when we barely see the sun for weeks on end. Holy Grail! This has been a cult Memebox product from the earliest boxes they sent out. I have the 30ml jar and love how hydrating and soft the product makes my face. And it smells of and looks like melting mozzarella cheese, strings and all! Plus, it does not break me out and mattifies my face. What more can one ask for? 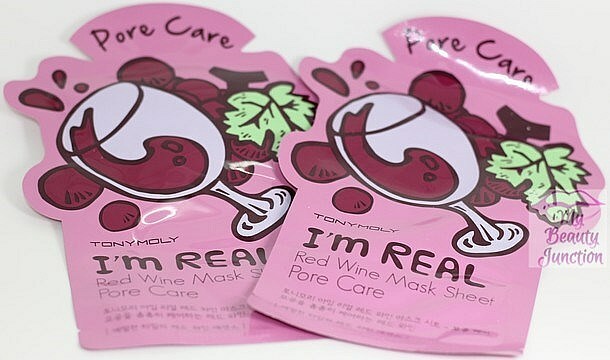 Red wine sheet masks - what is not to like? These sheet masks are free of parabens, talc, benzophenones, tri-ethanolamide and tar colouring. They are meant to even out skin texture and maintain moisture-oil-balance. I love these and wish Memebox had sent out another red wine face pack, a cheese pack and a wine cleanser. It's just that I love the theme of this box so much! One of the best themes from Memebox! 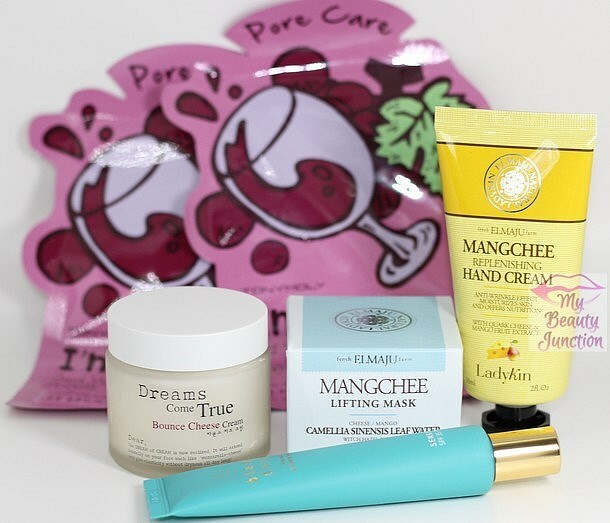 I really wish Memebox had separated this theme into two boxes - Wine skincare box and Cheese box. That would have been amazing. If ever they release a second edition to this, or separate wine and cheese boxes, I would grab them on the spot - just like the chocolate boxes. I love everything in this box and wish there were more wine-products, really. Something shaped like a hunk of cheese. Something shaped like a wine bottle or even a corkscrew. More fun products that work. I also want a wine-serum with plenty of resveratrol. Cleansers. Packs. Body lotions. Cannot have enough of this box. Memebox has not been releasing new boxes of late - rumours have been flying across the beauty box addict world, ranging from "concentrating on shop products" to "broke". I am of the wait-and-watch-for-a-month opinion. There have been a few restocks which, as usual, sold out very quickly, but you can keep an eye open here. I except a New Year box at some point over the next couple of weeks. Irrespective of what you buy, code HT3BPO will get you $5 off orders above $30!